The following are snippets of information about the picnics, parties, and other social events enjoyed by the citizens of St. Louis Park in its early years. Information has been pieced together from several sources, including the minutes of meetings of the Volunteer Fire Department (VFD), which held an annual carnival from 1920 to 1962. Unfortunately, the Park didn’t have its own newspaper until 1941, so information before then is sketchy. The Minneapolis Journal reported that the St. Louis Park Band made its debut at the Memorial Day Parade on May 31, 1900. Band concerts were held at the Bandstand in what is now Jorvig Park each Friday night during the summer. An article in the Dispatch reported that Fourth of July celebrations were held from 1906 to 1917. One of the high points was a parade from the high school ball field past Christy’s gas station (Lake and Wooddale), down Wooddale to present-day Jorvig Park. There activities including a contest to climb a greased pole to get money at the top. The picture below is from July 4, 1909 – is that the pole in the middle? One particular Fourth of July was captured by a photograph in 1911. The picture shows a decorated coal wagon led by a couple of jackasses to make a float for the parade. Village character Dutch Reider is one of three men seen wearing policeman’s uniforms that must have been “borrowed” from Hopkins, as there were three uniforms but only one policeman in the Park at the time. Mrs. Thomas Thompson recalled that the men “got together early in the morning. By noon they were already full of holiday spirit and spirits.” Since it seemed like everyone in town was in the parade, Mrs. Thompson wondered who was left to watch it. St. Louis Park’s big jubilee celebration will be the biggest charitable, fun-making and booster day in the history of the suburb which loyal citizens maintain will some day make her big sister Minnie famous. In the past, celebrations at St. Louis Park have been under the auspices of local musical or fraternal organizations. This year the newly organized Commercial Club, the strongest loudest hardest-working bunch of citizens any live town ever had, is back of the jubilee and every one of them is working his head off to make it a success. The day was to start at dawn with a 100 gun salute. From 7 to 8:30 am, the Monitor Drill Concert Band, Captain C.J. Bradley directing, was to play at Central Park. At 9am, “the industrial and divisional parade will form with the calathumpians.” A clue to what the calathumpians were lies in the announcement of the prize for the most comical makeup. At 10 the races began, featuring potato and sack races, races, and ball throwing. A Baby Show was to take place at Central Park, with Dr. Fitzgerald and Dr. Wade acting as judges. Then there were the orators, the St. Louis Park vs. Hopkins baseball game, a competition of the uniformed drill teams of the Modern Woodmen, and dancing “at the enormous open air dancing pavilion in Central Park. Justice Thomas Brennan, noted judge of Kentucky, presided over the Kangaroo Court, where fines were 15 cents. The event, which previously been sponsored by civic clubs, was now sponsored by the Commercial Club along with the Modern Woodmen. Proceeds of the 1914 celebration were to go to the father of 17-year-old Esther Monson, who was killed in a devastating tornado on June 23. George Seirup recalled seeing the 1914 parade as it came down Chestnut (35th) Avenue, led by old Captain Bradley in his Civil War uniform. The Fireman’s Carnival was apparently discontinued in 1918, the year of the Spanish Flu epidemic, according to the Firemen’s minute books. The VFW put on fireworks displays almost every year since that time. The Fireman’s Carnival was generally counted as starting in 1920. Profits were used to provide assistance to ailing firemen, pensions, and to fund the mobile Santa Claus program, in which Santa went around on a fire truck distributing food to 30-40 needy families. This “Christmas Cheer” program ran well into the 1960s, expanding to distribute candy to kids in addition to food to the needy. The McDonald Brothers appeared before the Village Council in December 1920, asking for permission to store fireworks and firecrackers in a concrete building near the Milwaukee Depot (owned by John Applequist). The Fireman’s Carnival was cancelled in 1931. The 1935 Halloween party was put on by the St. Louis Park Neewollah Club (Halloween spelled backwards, of course), sponsored by various organizations in the village. The Flakne Cup (named for the Mayor) was awarded for the most outstanding costume. The Fireman’s Carnival was held on July 29, 1939. The Fireman’s Carnival was held on July 27, and the Hopkins band was part of the entertainment. Park businessmen entered a float in the 1941 Aquatennial parade. The VFD authorized $100 to spend, but it is unclear whether it was to build their own float or participate in the one for the Village. The annual Fireman’s Carnival was held on July 25, 1942. In 1943 the Village celebrated Independence Day on the 5th of July, since the 4th was a Sunday. The Fireman’s Carnival was held on July 31, and featured a merry-go-round and bingo. An estimated 5,000 people showed up, and some had to be turned away. Rationing had limited the amount of food available, and they simply ran out of hot dogs, pop, and ice cream. There was a drawing for war bonds donated by the War Department. Jake Werner was the chairman of the event. Net proceeds topped $1,000. Three firemen were arrested at the 1944 carnival by the Sheriff for running a bingo game, including Kurt Scheibe and H.J. Bolmgren. The sentence was suspended, but it resulted in the Minnesota law allowing bingo games for charity, even though bingo games had been run without problem for the past 22 years. The bingo game was a major endeavor, with businessmen buying blocks of tickets and contributing prizes, and firemen going door to door selling tickets. The arrest severely curtailed the profits reaped from the carnival that year. 1945 saw a new law that allowed bingo to be reinstated. The bingo area seated 140 people and was full for every game. The carnival was held on August 11 and 12 on Brunswick and 37th by the old fire barn. Net profits zoomed to over $2,000. There were no fireworks in 1946, perhaps because the returning soldiers had no stomach for bombs bursting in air. The Fireman’s Carnival was scheduled for August 3 and 4 with Midway Shows, but on July 29 the Village Council banned all public gatherings, carnivals, fairs, or entertainments until the danger of polio was past, as four Park citizens had died of the feared disease. The Fireman’s Carnival was postponed until October 12-13, but featured all of the usual attractions: rides, fish ponds, bingo, and refreshments. Profits were just over $1,000. The opening of school was delayed for two weeks, and the Hennepin County Fair was postponed from August to September. The Hopkins Raspberry Festival went on as planned in July, but ads promised that the grounds would be heavily sprayed with DDT to lessen the danger of polio. An estimated 3,000 persons came to that event. The Fireman’s Carnival was held on August 2-3, 1947. A new anti-gambling law and enforcement of old laws changed the way that tickets were bought and prizes distributed, but bingo did go on. 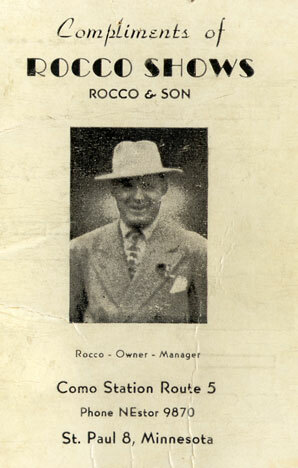 A merry-go-round and a ferris wheel were provided by Rocco Carnival. The Fireman’s Carnival held on August 7 and 8, 1948, Kurt Scheibe, Chairman. The event featured a “children’s hour,” with doll buggy and bike parades and field events. The 1949 Fireman’s Carnival yielded $2,319, but did not seem to be covered in the Dispatch. 1950 saw what was called the first annual Community-Wide Fourth of July Celebration since 1919. The Celebration started on July 1 with a teen-age dance at Carpenter Park, where they selected a Park Queen. This was also the venue for a huge gala community square dance on July 3. The Festival itself was held in Oak Hill Park, and featured bingo, “corn games,” footraces, a husband calling contest, rolling pin contest, skill games, the one-legged hop, shoe scramble, and the sticky egg toss. Earl Ainsworth reportedly split his pants playing Bingo too hard. The games went over so well that concessionaires ran out of prizes. Shorty Dale was “instigator and chairman” of the festival, and also in charge of the games concessions. He spent a sleepless night at Oak Hill guarding the booths. “To think I started this thing so I wouldn’t have to take my kids to Powderhorn Park,” he muttered. A parade traveled past Christie’s station down Wooddale to the bandstand. 12,000 people attended. Churches provided the refreshments. Nathan H. Epstein was the Chairman of the Recreation Committee. Sponsors included McGarvey Coffee, National Tea, and Red Owl. Beeman gum, Life Savers, and Phillip Morris handed out free samples. The 1950 Fireman’s Carnival was held on August 12 and 13 at its new location at 37th and Wooddale. Dr. Porter donated his old veterinary building as a kitchen if the VFD bore the cost to move it (photo below). It had hot and cold running water. The bandstand had an underground electrical system. There were toilets and stands (made out of pipe). The carnival netted over $2,000 and was deemed the best Fireman’s Carnival in 30 years. In 1951 the Fourth of July Community Festival at Oak Hill Park included pony rides and bingo, and drew 20,000 to 25,000 people. The Miss St. Louis Park coronation took place at the festival, and music was provided by Hugh Cardenas (a Park senior) and his Castillians. The Fireman’s Carnival was held on July 17-19, with rides provided by Wolf Shows. The Chamber of Commerce sponsored the Queen contest and she was introduced at the carnival. Net take was $2,779. Larry Sauter and A.A. Provencher rented Village property at 37th and 100 for a kiddie recreation project in April 1952. Sauter was the builder of a miniature kiddie train that toured the area and is now at the Transportation Museum. In 1952 the VFW obtained a permit to run its annual carnival on Village property at 37th and Highway 100. The Fireman’s Carnival was held on July 15-17, with rides from Wolf Shows (rep. Mr. Bussy). Profits exceeded $2,000. On June 22-23, 1953, the Chamber of Commerce sponsored a free circus – the Jay Gould Million Dollar Circus, to be exact, boasting 50 trucks and buses of talent. The festivities were located between the fire station and Highway 100 on Wooddale. Also in 1953 regular fireworks displays were resumed, provided by the VFW. They were first shot off across the street from their post at the Friedheim concrete plant, into the 1960s. They were later moved to Oak Hill Park, and then again to Aquila Park to accommodate government regulations. The Fireman’s Carnival was held either the last weekend in July or the first weekend in August. Mr. Bussy, who had been with Wolf Shows in 1952, was now with Collins Shows, so the VFD decided to go with Collins. A record $2,812 profit was made. After neighborhood complaints, the bandstand was torn down in 1954 after 40 years of use. A ball diamond took its place. In Rev. Einar Martinson’s obituary, his sister says that in 1954 Martinson decided that the Village should have a big Fourth of July celebration/Family Fun Day. The celebration featured a picnic, patriotic music sung by church choirs, foot races, an address on freedom by Martinson, and fireworks. Could this have been in 1950? The Fireman’s Carnival was held on July 27-29, 1954. The VFD hired Wolf Shows, represented by Mr. Warwick. The Fireman’s Carnival was held July 26-28, 1955. Rides were provided by Klein Shows of Sioux Falls, represented by Mr. Buese. For the first time the volunteers joined with the new paid Fire Department and they went 50-50 on the carnival. The net profit was over $3,000. The VFW started an annual Fourth of July celebration. The 1956 Fireman’s Carnival was held July 24-26 at the carnival grounds east of the fire station on Wooddale Ave. Rides were provided by Klein’s Shows and refreshments were handled by the firemen’s wives. Net profit was $2,892. 1957 saw a Fourth of July Picnic at Oak Hill Park, sponsored by the VFW. It was quite an affair, with games, contests, Little League games, a doll buggy parade, and a “corn game” for the adults. This was also the venue for the junior royalty coronation. The 37th consecutive Fireman’s Carnival featured Fire Chief Don Buelow, purveyor of the world’s best Wimpeyburgers. The Carnival was held at 37th and Wooddale on July 23-25, 1957, with 15,000 people joining in the fun. Rides were provided by Kline Shows, represented by Mr. Buzzy. Relating to rides, the City passed Ordinance 662, regulating mechanical amusement devices designed especially for children. The fee for the license depended on how many children could ride the ride at one time. A VFW Carnival Jamboree was held at Highway 100 and 36th on May 22-27, 1959. St. Louis Park apparently did not hold its own Fourth of July fireworks display in 1959, as the Dispatch invited everyone to view fireworks in Hopkins. The 39th Annual Fireman’s Carnival was held at 37th and Wooddale on July 21-23. Bingo, rides (including the popular Octopus), and skill games were among the attractions. Proceeds paid for the Little League team and the annual Christmas tour. The fifth annual Fourth of July celebration was held at Oak Hill Park, sponsored by the VFW. On exhibit was the evolution of modern transportation, with ponies, a miniature train, and a helicopter. David Blanchard was the general chairman of the event. The 1960 Fireman’s Carnival was held from July 26 to 28 at 37th and Wooddale. Rides were provided by Kline Shows. The 12th Annual VFW Jamboree was held on City property. The VFW also sponsored the Fourth of July celebration at Oak Hill Park. An Outdoor Fun Festival was sponsored on May 15-20, 1961 by the merchants of Miracle Mile, Knollwood, and Excelsior Blvd. The City was celebrating its 75th anniversary. A diamond ring treasure hunt was sponsored by the Chamber of Commerce. The King of the Backyard Barbeque Contest brought out 32 contestants who served up 1,000 pounds of roast beef. An Air Force Ajax missile was on display at Knollwood. Another attraction was a seal show. The final Fireman’s Carnival was held in August 1962. In this spectacular photo below by Steve Brown you can see the carnival and the construction of what would become the Topps Store (now Burlington Coat Factory) in the background. Miracle Mile held “Extra Value Days” as part of the Outdoor Fun Festival. This was a chance to meet some of the Minnesota Vikings, who had just come to town, and register to win season tickets. The festivities included a performance by the High School band and appearances by 10 Miss St. Louis Park finalists, finalists for the Junior Queen and Commodore contest, and Mayor Wolfe. The Queen finalists also did some informal modeling. 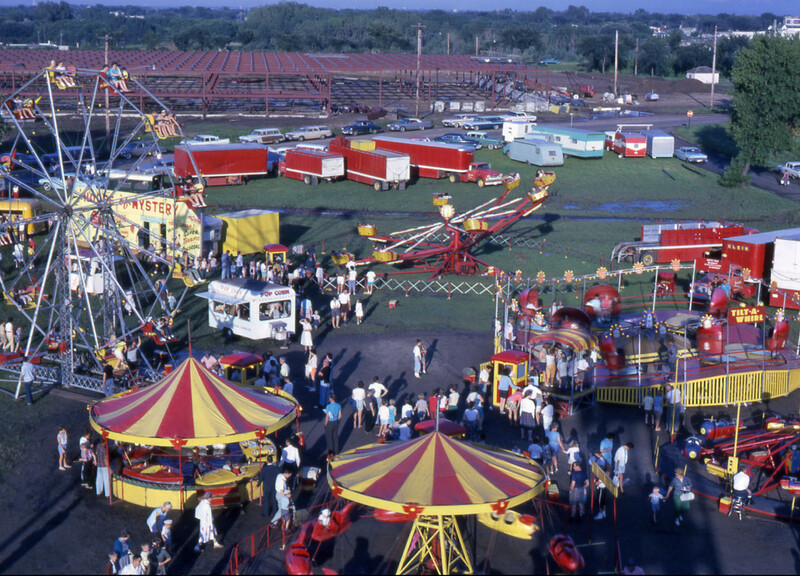 The Fireman’s Carnival was discontinued after 42 years when the lot on which it was held was purchased by Minnesota Rubber. In its place was a “Grand Old Opry,” chaired by Eugene McGary and Kenneth Birkholz. Also instituted in 1963 was the Fireman’s Charity Ball. 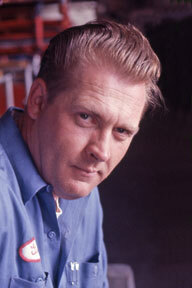 Gerald Kurth, member of the VFW and city plumbing inspector, took charge of the City’s fireworks from 1964 to 1975. In 1965 the St. Louis Park Forum, a short-lived rival to the Dispatch, announced that it was sponsoring the first annual “Park Pageant” on October 7-13, 1965. Forum publisher Elliott B. Hoffman chaired the meeting of 25 committeemen at the Forum’s offices. The purpose of the pageant, he said, was to “stimulate a greater appreciation of the civic, cultural, religious, social and business facilities of St. Louis Park.” He also wanted to publicize the city nationally. The theme of this first (only?) pageant was “Know Your City.” Activities included special sales, open houses, a parade, carnival, art exhibit, street dance, jazz ban rally, dance contest, and special activities organized by civic groups. 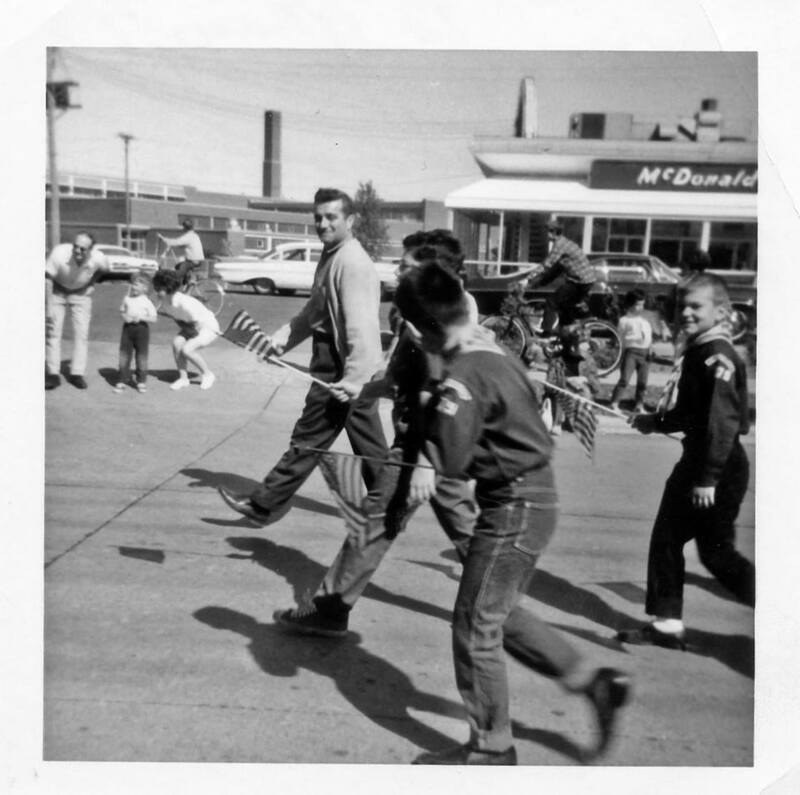 Here’s a picture of the 1966 Memorial Day parade, posted on Facebook by Randy Kirihara, who is in the foreground. This is Cub Scout troop 79, led by Lloyd Arnovich. See separate entry for Robin Hood Days, which was sponsored by the Chamber of Commerce and ran from 1967 to 1971. 1973 was the second annual St. Louis Park Historical Society Ice Cream Social. About 600 people came out, including Mayor Frank Fleetham who pitched in to scoop ice cream. Entertainment was provided by the St. Louis Park Community Band. The Olde Towne Picnic was held on June 30. The Historical Society’s third annual ice cream social was held on July 28, 1974. The official bicentennial flag was presented to the City on behalf of the American Revolution Bicentennial Administration by a host of politicians, including Mayor Frank Fleetham, Rep. Bill Frenzel, and Hennepin County Attorney Gary Flakne. Park was one of the only cities in the area that had its application for official bicentennial city status approved at the time. 1975 was the year of the 7th annual Olde Towne Picnic on June 30. The threat of rain cancelled the performance of the community band (it didn’t rain after all), but the antique fire truck from 1928 did make an appearance. The picnic was sponsored by the St. Louis Park Historical Society. The fourth annual ice cream social was held on July 27. The 1975 Fourth of July fireworks show was put on by the VFW in Aquila Park and cost $1500. 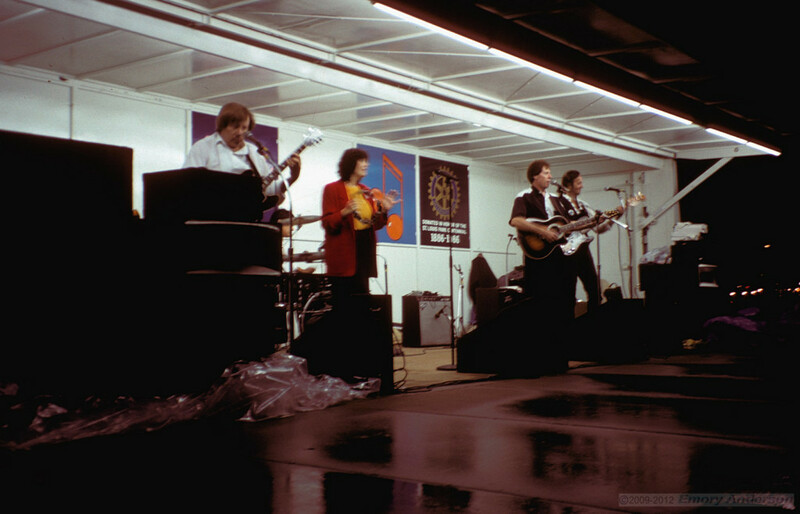 St. Louis Park celebrated the country’s bicentennial and the City’s 90th birthday in September 1976. The celebration, co-chaired by Karen Reeves and David Abramson, included a parade, senior citizens art fair, and street dance. Palm Bakery made a birthday cake for 1,000 people. There was a program, emceed by Halsey Hall. On September 16 there was a program at the Ambassador Motor Hotel honoring former Mayors, volunteers, and others who have contributed to the Park. Special recognition was given to Marie Hartmann of the St. Louis Park Historical Society, Cliff Dahl, Hennepin County’s Outstanding Senior Citizen, and Jackie Ingersoll, Outstanding Citizen. Also in 1976, the Historical Society held its Olde Towne Picnic on June 27, and the third annual ice cream social on Sunday, July 28. In 1976 Park celebrated its 91st birthday with a party in the community room at City Hall. Honored guest was Cap Bjornson, who was also 91 years old. 1977 saw the 9th annual Olde Time Picnic. Park Fest was held on June 3-4, 1978, held by St. Louis Park Community Education and the City. Most events took place at the Rec Center ice rink. The many events included tennis and softball tournaments, a marathon, swimming and diving exhibitions, an antique car show, school art displays, and demonstrations in gymnastics, Frisbee, dog obedience, and square dancing. The Optimists held a bicycle safety check. The Jaycees also sponsored a kiddie carnival. The 1978 Olde Town Picnic was moved from June to September. The Rebekah Lodge sponsored an ice cream social at the depot on August 18, 1980. It coincided with the annual picnic of the Telegraphers Association. See separate entry for Party in the Park, which was held from 1980 to 1991. The City celebrated its 96th birthday at an event at City Hall on October 21, 1982. Master of Ceremonies was Mayor Phyllis McQuaid, and Harry Segal, 96, was a special guest. The event was sponsored by the Council of Organizations, Associations and Citizens. On September 18, 1983, the Historical Society hosted a showing of antique Pontiac cars, owned by Milo Alexander. See separate entry for Park’s Centennial celebration of 1986. The Historical Society sponsored an open house on September 1, 1986. 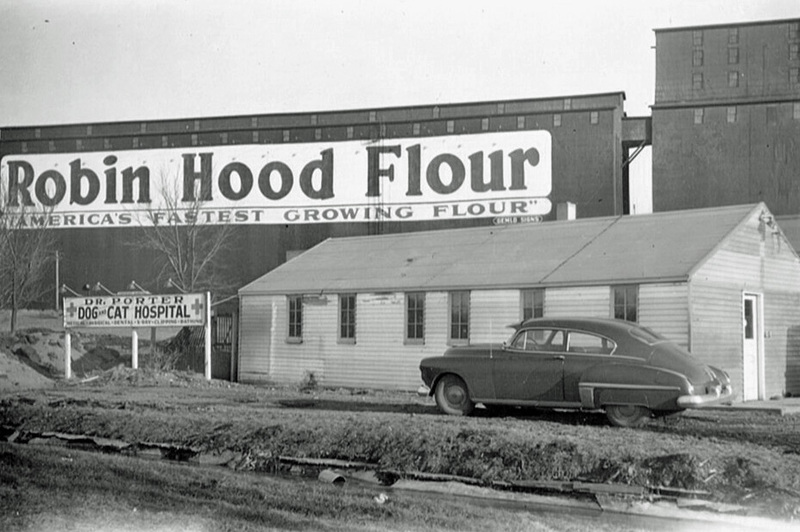 Featured were Milo Alexander’s antique Pontiac cars. On July 5, 1987, an open house was held to celebrate the depot’s centennial. The event was part of Party in the Park, and featured music by the Northern Dixie Ramblers. See separate entry for Parktacular, which started in 1995. The first Parktacular celebration was held on June 11-15, 1997, in conjunction with the Rec Center grand opening. On October 15, 1997, a tree was planted in Jorvig Park in honor of Marie Hartmann, who passed away in May 1996. An open house was held at the Historic Milwaukee Road Depot on Saturday, October 24, 1998. The 1999 Historical Society Ice Cream Social was held at the Depot on July 10. The 2000 Historical Society Ice Cream Social was held at the Depot on July 21. The 2001 Historical Society Ice Cream Social was held at the Depot on July 11. The 2002 Historical Society Ice Cream Social was held at the Depot on September 21. The 2003 Historical Society Ice Cream Social was held at the Depot on September 14.